Chiswick Community School has won the Jubilee Cup for best Business and Education Collaboration, with BAM construction and Gunnersbury Catholic School at the Hounslow Education and Business Partnerships’s awards ceremony at Eton College last week. Collecting the cup on behalf of the school, James Whiting (Deputy Head) said; "It is a great privilege to accept this award. 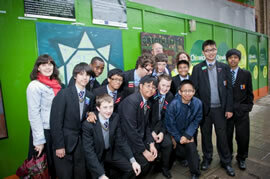 The project was a really exciting and visual one which everybody in Chiswick must have seen. The school is working with a number of business partners to enhance the education of our students and it is great to have recognition for this work." The project involved year 13 Art students from the school working to a brief set by BAM construction to design a mural for the boards surrounding their site on Chiswick High Road. The mural had to be environmental in theme to emphasise the company’s green image and was based on the work of two artists Julian Opie and Michael Craig-Martin. ‘We are really proud to have achieved this prize’, enthused Julie Herd, Head of Art at Chiswick. ‘It was the year 13 group’s first major public exhibition. Many of the students have been accepted on Art courses in FE starting next year." "It was really exciting to work to a deadline for a real project", said Jessie McCullum, one of the students involved. "It was great to see my work up where so many members of the public will see it."